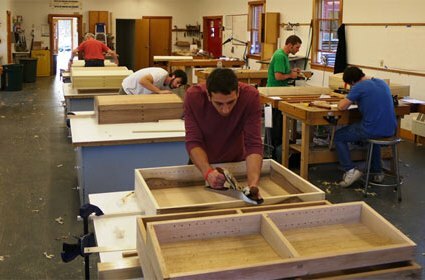 Students at the Center for Furniture Craftsmanship in its nine-month comprehensive furniture-building program. Peter Korn's life of woodworking began when he ran against the academic grain as a senior in college, choosing the woodworking trade instead of academia or a business career. That's something I identify with. Korn and I are just a few months apart in age, and when we came to our majority, in the early 1970s, followed similar career paths following college. My journey lead me to practice the printing trades - attending trade school and working in a number of print shops. And years later, as a journalist, I cover woodshops. In a new book, Why We Make Things and Why It Matters: The Education of a Craftsman, [Godine, 176 pages, $24.95] Korn tells the story of his career. He founded the Center for Furniture Craftsmanship in Rockport, ME, and has spent the past four decades working - and ruminating - on the role of furniture making in the life of the mind. The challenge of bringing something new and meaningful into the world through one's own volition, says Korn - whether in the arts, the kitchen, or the marketplace - is what generates authenticity, meaning, and ultimately, fulfillment. Korn begins his journey through woodworking, from Ivy League-educated middle class young man employed as a novice carpenter on Nantucket. He transitions to self-employment as a designer and maker of fine furniture, teaches at Colorado's Ander­son Ranch Arts Center, and finally founds the Center for Furniture Craftsmanship, now widely known and respected. Korn has written a best-selling how-to book Woodworking Basics: Mastering the Essentials of Craftsmanship (Taunton Press, 2003). But in this book he gets at the "why" of craft in particular, and the satisfactions of creative work in general.